IMPORTANT NOTES: This app requires a monthly paid subscription( Starting at $3.99) Only supports the following carriers: - Sprint, AT&T, TMobile, and Verizon Pay As You Go and Pre-Paid accounts are not supported Call Unblock VoiceMail replaces your iPhone VoiceMail to unlock the power of your phone. This app brings you the all the features you need to take your voicemail to the next level. Features Include: - Unblock Blocked Caller ID - Reverse phone number lookup - Visual voicemail - easily see and play your voice mail - Voicemail transcription - convert voicemail to text - Missed call alerts - Call recording - Voicemail transcription Say good bye to annoying heavy breathing callers, stop wasting time wondering who is calling from a blocked number, and identify telemarketers before you even pick up your phone. 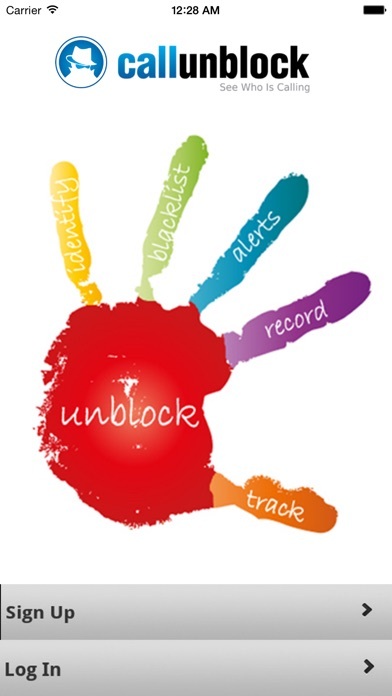 Call Unblock can reveal the phone number of a person calling with a blocked number. When a call comes in with a blocked Caller ID, simply reject the call or don't answer. This will send the call to CallUnblock for caller ID retrieval. The call will quickly be sent back to you. This time with the caller ID unmasked. The caller hears a normal ring tone and is unaware that the call is being traced to its source. 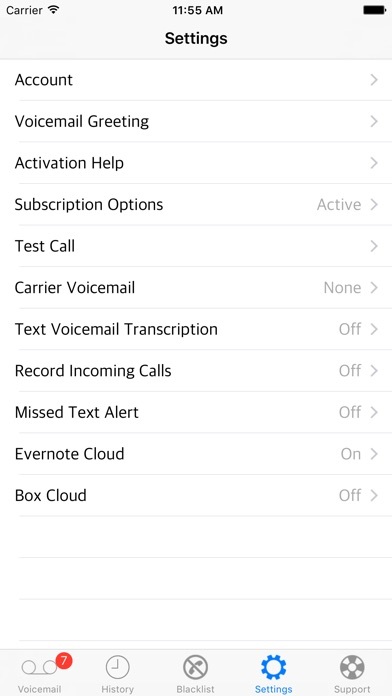 CallUnblock has Visual VoiceMail and VoiceMail Transcription. No need to lower the t.v volume or put on headphones to listen to your voicemail. 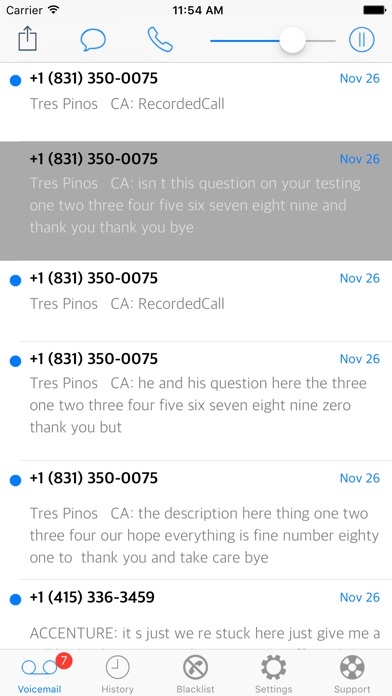 A quick glance at your inbox shows you who called and a transcribed text version of the message. No more guessing who is calling you. 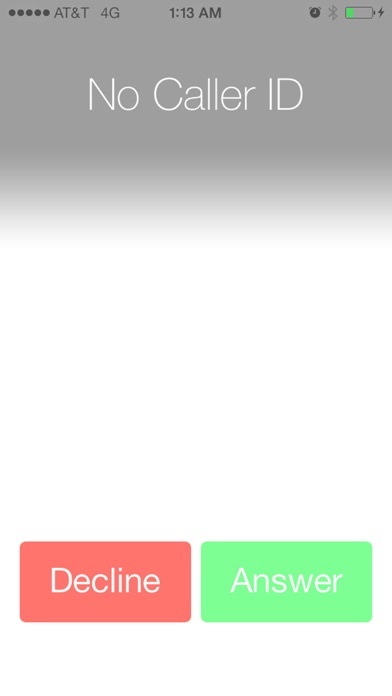 CallUnblock's Reverse Phone Number Lookup service provides you with the name of the caller based on their phone number. Our service queries caller ID data sources and displays the name of the phone number’s registered owner when available. **NEW**CallUnblock Premium Subscription Includes all the features of CallUnblock Basic plus - Cloud integration with EverNote and Box.com With CallUnblock Premium you will be able to 1. 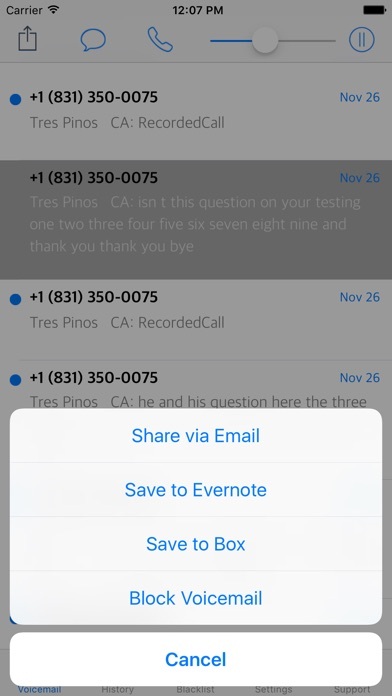 Share voicemails to Box/Evernote directly from the app 2. Share Voicemails to Emails 3. Easy Cloud storage of voicemails 4. Voicemails upto 5 mins in length 5. Call recording 6. Block voicemails for selected phone numbers by sending the calls to a not working number Note: This app requires your calls to be forwarded to CallUnblock for processing. You will need to follow the instructions to configure your phone for conditional call forwarding. HATE THIS APP! After using it, I can no longer receive voicemails! My voicemail is messed up and I’m not about to get a hold of anyone to help. DON’T DO IT! This ap is awful to discontinue using and customer service is of no help. It will continue to capture your voicemails and you have no access to retrieve them. No one will respond when you email and call for help!! If I could give negative stars I would. I keep emailing and calling to get help and still no reply that helps me fix my phone to get control of my voicemail box back now that I’ve discontinued the ap. I wish I would have read the review of this poor woman prior, but she is 100% correct. You will not be able to reach anyone from this company bc it’s all 3rd party. This app will mess up your phone on the cellular level& you will not be able to receive voicemails once you try it. The app will forward all calls to a automated voicemail which will tell callers that your voice box cannot be located & to enter a number. When u sign up, it asks you to enter a series of numbers to start but DONT DO IT!!! It will reset your phone!!! I’ve contacted apple support and Sprint to override it.... I’m currently waiting on the engineering team at Sprint to help me “Undo” whatever commitment I made with this app. Have not been able to get messages for 10 days now. Save yourself the trouble and do not even try this app!!!!! It works but it’s disables your voicemail permanently if you remove it or don’t pay subscription.